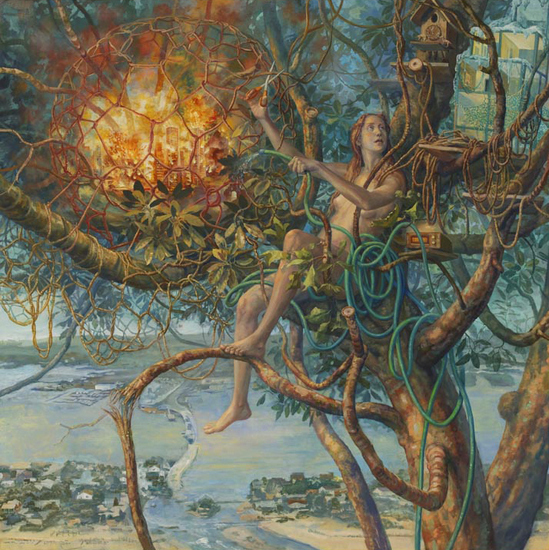 www.johnseed.com: Julie Heffernan: "Sky is Falling"
"If the imagination is shackled, and nothing is described but what we see, seldom will anything truly great be produced wither in Painting or Poetry." 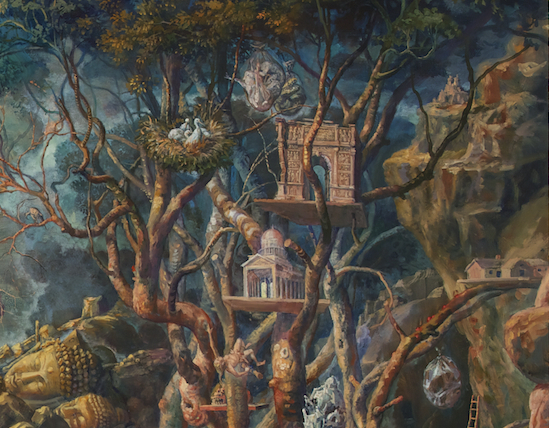 Julie Heffernan's exhibition Sky is Falling features eleven paintings that portray the artist's imaginative visions of a world that is blighted and chaotic yet somehow still transcendent. Each painting depicts a vignette that is an enchanted allegory of the artist's anxieties about the future, oxygenated by her imagination. 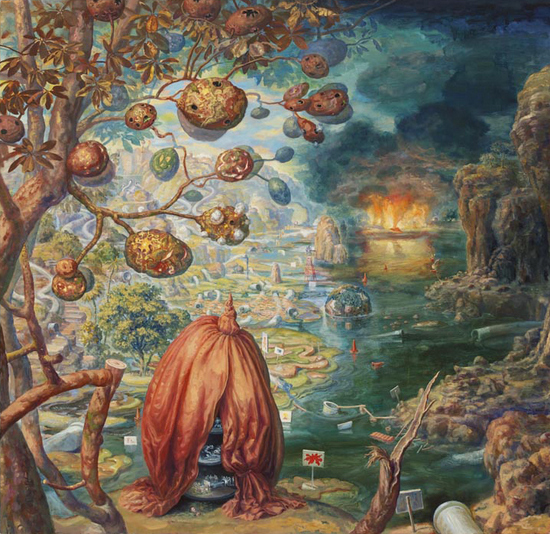 Most are set in visionary landscapes that are simultaneously sheltering and threatening. The title of each canvas begins with the words Self-Portrait, which are there to remind us that the scenes are portraits of a personal and internal world, not literal depictions of the artist herself. Heffernan paints to try and make sense of things and to reconcile her despair over what man has done and is doing to the environment. Alongside her anger there is an optimistic yearning for healing fused with a pragmatic drive for self-protection and survival. Rich, complicated and paradoxical Heffernan's recent works offer a new Romanticism designed for our damaged planet. 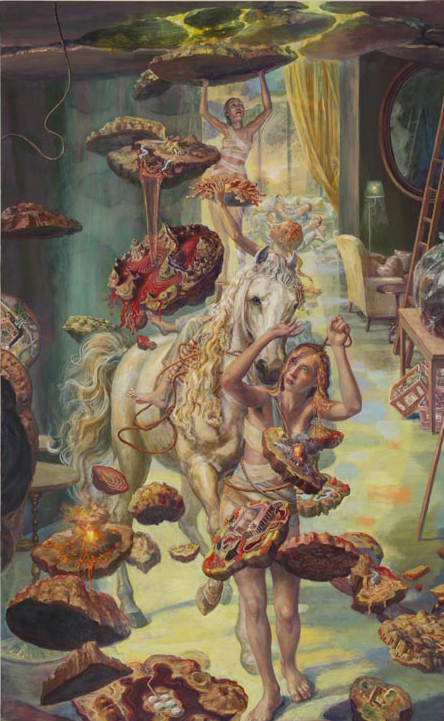 I recently interviewed Julie Heffernan and asked her to discuss her ideas, and to offer narratives for five of the paintings on view at PPOW gallery through November 16th. 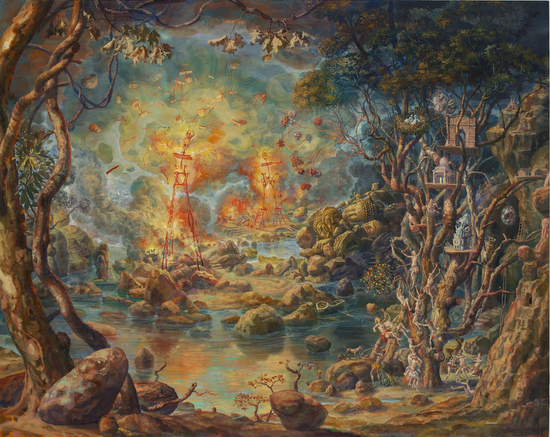 In your PPOW exhibition "Sky is Falling" many of the paintings include landscape settings that seem rooted in Romanticism. Where did you get the inspirations for these settings? I grew up in the West, so I'm inclined towards mighty spaces. Cole and Bierstadt's Grand Landscapes, though typically 19th-century romantic, make perfect sense to me: our family's version of a cheap vacation was camping in gorgeous National Parks like Yosemite and Lassen. For Cole, like us, these places got us as close to god as we could possibly imagine being, but at the same time, they represented what we had lost, any kind of real relationship to the natural world beyond what LL Bean could trick us out with. Since each of your works has as aspect of self-portraiture, what role are you asking landscape to play in relation to that? I find myself repeatedly drawn back to the landscape to explore my own issues, both planetary and personal. In these latest paintings I wanted to see what sense I could make of the landscape around me after calamities like Hurricane Sandy and the BP oil spill. I've invented alternative habitats, mechanisms for storing food and things we can't live without, like water and books in Self-Portrait as Last Resort. I needed to do this, to imagine another way, give myself a hose to stop all the burning, as in Self-Portrait as Catastrophic Failure, to calm my fury at what I hear and read everyday about the realities of climate change and its effects on people all over the globe. 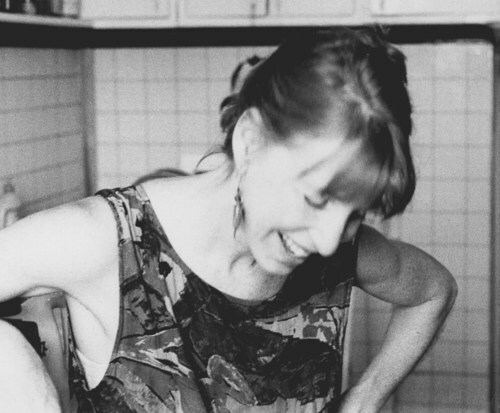 Tell me about the sense of righteous anger and you want these works to transmit and what that anger connects to. I see similar furies simmering in the work of Thomas Cole as he confronts the particular struggles of his time: the Industrial Revolution and the changes it wrought on civil society. Today it's the invisible nature of our environmental problems that really drives me nuts. Whether it be Monsanto's poisons creating "superweeds" and "superbugs," or the proposed Keystone XL pipeline running stealthily through the Ogallala aquifer, potentially contaminating our biggest underground freshwater supply, the average person can't see what's happening to the world, because the cause of toxicity can be thousands of miles away, or simply kept secret. These are the kinds of things I was thinking about in Self-Portrait as Gulf Clean-up Plan. How do these works differ from those in previous series? Over the years I've been making paintings that tell stories, but in these paintings I wanted my work to name names, point fingers, show some of the darker corners of American history--greed, empire building, corporate overreach-- and find imagery that shows some of the so-far invisible consequences of our reliance on dirty energy sources and toxic farming practices. And yet, as a painter, I am still drawn to Beauty and Art, to the cultural artifacts that made us Great. What can you tell me about the image of Self Portrait as the Other Thief in which models of Monticello and a Roman Arch are nestled in a tree? In Self-Portrait as the Other Thief I'm interested in gods and temples and rituals, and what happens to them when they don't work for us anymore: places like Monticello--an American temple--with its fraught history of incompletion, multiple ownership and familial inter-racial conflicts. Jeffersonian architecture is the antithesis of the kind of tract home I grew up in; it's all permanence and aesthetic sweep in a way that was meant to coordinate with European values and call us to higher purposes. But it was a bit of a boondoggle itself: unfinished by Jefferson, it went through stages of dereliction until it eventually achieved historical landmark status, only after it was finished by a Jewish owner. This kind of history reflects a larger American cultural history of grand ideas tempered by conflicting ideologies and foreign influences. Is there some optimism in this series? 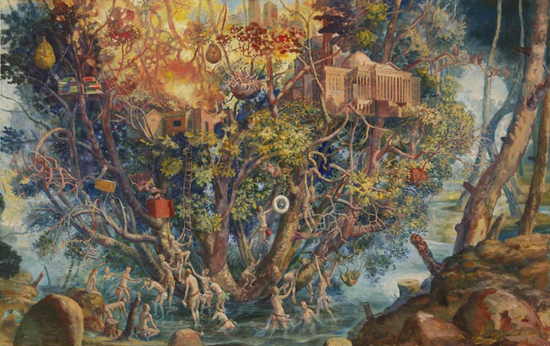 In the face of all this I continue to imagine alternatives to it, like tiny worlds inside the knothole of a tree, full of rooms with events going on inside that describe aspects of the human condition: circumstances of failure, feckless action, violence, love and redemption. In Self-Portrait Running Amok the roof is coming down, detritus is piling up, and in the process we're getting rid of things we don't need anymore - like the Pentagon and Exxon Mobil headquarters and all those oil spills. In these new paintings I want to think up new possibilities, distinctly different environments in which to live, breathe, work and travel far.